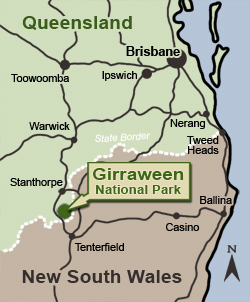 This website is dedicated to Girraween National Park, which is situated in the state of Queensland, Australia. Girraween National Park is famous for its granite landscape, eucalypt forests, sedgelands and heathlands. These varied environments are home to a wealth of plants, animals and fungi - some of which are unique to the area. Girraween is an Aboriginal word which means "place of flowers" - an appropriate name for this park. In Winter (July), the wattle trees burst into blossom and are a sight to see, but Spring (September and October) is the best time to visit, for the countryside is bright with colour as a profusion of native wildflowers put on their spectacular annual show. Summer is when the flannel-flowers, bottlebrushes, paperbarks and eucalypts bloom. Animals, of course, can be seen all year round. Dawn and dusk are the best time to spot the local mammals. Some, like the Eastern Grey Kangaroo and Common Brushtail Possum are quite used to people and regularly venture into the day use and camping areas. Kookaburras, magpies and currawongs also frequent the day use and camping areas. The park is home to over 150 bird species. Girraween National Park is approximately 260 km by road south-west of Brisbane (about three hours' easy drive via Warwick) and is located on the border of Queensland and New South Wales, on the northern end of the New England Tablelands. It covers 11,800 hectares, with an average elevation of 900 meters above sea level. The park has a number of walking tracks of various lengths and difficulties (Class 2, 3 and 4). There is an information centre and excellent day use areas with lots of parking. There are also two large camping grounds and Bush camping is permitted in some areas. This is not the official website for the park, however, the park's rangers and a number of local groups have assisted us greatly by providing us with information and photographs, not to mention their enthusiasm and support. We've done our best to provide accurate information, but if you should happen to find a mistake, please let us know. Also, if you feel you have something to contribute to the growth of this website, whether it be comments, information or photographs, we would love to hear from you. Our contact details are on the Contact Us page. For more about Girraween National Park, we suggest you visit its Official Site at the Queensland Government's Department of National Parks, Sport and Racing (NPSR). You might have noticed that there haven't been many updates to this website these past couple of years and none this year. The site is by no means dead, it's just that we have been very busy doing other things, such as traveling overseas. Another thing that has made me reluctant to add new material to the website is that technology has changed and the system behind it is obsolete and needs to be updated. This will not be a trivial task!